Swami Ishtananda, joined the Ramakrishna Order in 1976 and received his sannyasa ordination in 1986. While in India, the swami served in the educational institutions of the Ramakrishna Mission, primarily at the Vidya Mandir College, Belur Math; at Cherrapunji, Meghalaya; and at Along, Arunachal Pradesh. 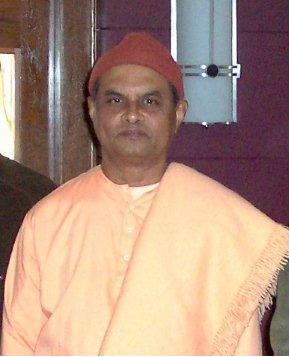 In February 2000, Swami Ishtananda was posted to the Vedanta Society of Southern California as Assistant Minister, and was responsible for managing the San Diego branch of the Society. During the eight years of his ministry in Southern California, Swami Ishtananda conducted weekly services at the monastery, served as an active member of inter-religious councils, and was invited to address students at various organizations and educational institutions. In December 2007 Swami Ishtananda was posted as the Minister and Spiritual Head of the Vedanta Center of St. Petersburg, Florida, the newest branch of the Ramakrishna Order in North America. The Center has shown signs of rapid organic growth under his leadership. As head of this center, the swami gives lectures and classes at the St. Petersburg, Florida branch as well as to other devotee groups in various cities in America and abroad. The Lord is my shepherd, I shall not want; he makes me lie down in green pastures. He leads me beside still waters; he restores my soul. He leads me in paths of righteousness for his names sake. Even though I walk through the valley of the shadow of death, I fear no evil; for thou art with me; thy rod and thy staff, they comfort me.